I recall two of your injectors were badly out of balance. Have the garage checked those? And is the inlet manifold thoroughly clean? Can you ask them to run a compression test on each cylinder? The car did have a remap on it previously which I've solved but the damage may already be done..
Fuel filter won't be causing that missing Geof.. it was the middle two cylinders out of balance. 1 and 4 were spot on.. 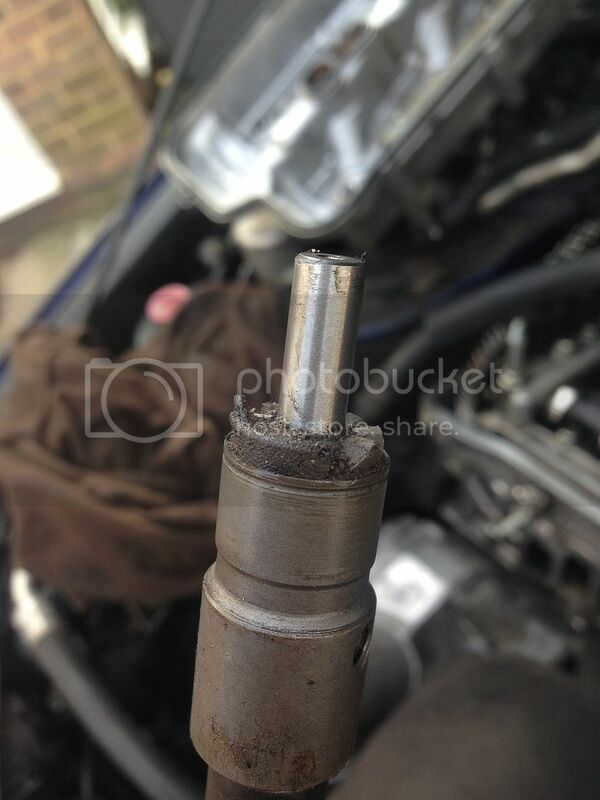 I suspect possibly very badly blocked inlet around those two injector ports.. or maybe a knackered cylinder head even. Can you tell if it's the middle two? Remove the stretch bolts and ease the injectors out, they may be seized in so be careful not to damage the alloy block. Clean the seat of the injector port and use new washers from Honda. Don't damage the alloy thread.. I used an injector seat cutter plastered with grease to clean mine. Of course, you don't want to cut a new seat, just clean it, so you don't need to apply loads of force. The debris from the hole sticks to the grease. This is what I was getting out of the seats. Same goes for his comment on the stretch bolts that hold the injectors in. Make sure the bolt threads, and the threads in the head are spotless before you install. Hi mate, so the injectors have all been tested and are fine? P1237 is actually a boost error Geof.. it's possible the sticking turbo is causing your misfire. Bang the turbo has gone ...smoke everywhere had to stall engine as it started to race!! and the ignition key would not shut it down (assume oil from turbo was keeping it running ) so turbo off next and inspect for further damage ...anyone know where i can pick up a reasonable priced turbo ....as long there is no engine damage!!!! !rogue car!! Edited by buckfusby, 02 January 2017 - 07:44 PM. All the shrapnel should go down the exhaust if it goes anywhere. Even if you had any of the cold-side assembly go up the boost pipe, it'd do well to get past the intercooler. Edited by Goodluckmonkey, 02 January 2017 - 10:11 PM. Thanks for the reply hopefully it has not damaged anything ...does anyone on here know of a mechanic who can sort this out for me and not cost me a remortgage!!!! Hi, any decent mechanic can swap a turbo on this car. Quite a few members have actually done it themselves.. It's not that bad a job TBH. The worst bit's slowly working all the nuts off without shearing the studs. At least you stand half a chance though as honda use brass nuts.